In a blog post of about a week ago I discussed the pairings of contra-positive cards for the Ace through Ten in the suits of Pentacles and Swords. Now, as a follow-up, I will suggest what the pairs of contra-positive cards in the suits of Cups and Wands might say about each other. Again, my hope is that this will provide illuminating examples of the process of using CP cards. A. Opening up to new relationships, which the Ace of Cups can indicate, is generally a great thing, but sometimes we may have to be careful that this does not add more responsibilities (Ten of Wands) than we can handle right now. B. The feeling of being overloaded that we see in the Ten of Wands can be relieved by the suggestion of the Ace of Cups to open up to new relationships, which can take a bit of the load off your back or at least give you someone to commiserate with. A. The problems that block or inhibit our romantic relationships (Two of Cups) may be the walls we have built around ourselves due to past wounds, as seen in the Nine of Wands. B. Time may heal all wounds (Nine of Wands), but choosing to love (Two of Cups) heals them faster. A. When the Three of Cups indicates that your friends want to do something that you’re not sure is a good idea, the Eight of Wands could be a sort of “heads up,” a warning to leap out of the way … or it might suggest that you “go with the flow.” Let your intuition decide which. B. When your life seems to be rushing out of control (Eight of Wands), the support of good friends (Three of Cups) can be a valuable resource. A. If you are emotionally stuck in a rut (Four of Cups), maybe you need to re-engage with life and face its challenges head on (Seven of Wands). B. If the Seven of Wands indicates that you are feeling attacked, its CP card, the Four of Cups, might suggest that you should keep your eyes open for new options. A. If you are suffering the grief that the Five of Cups depicts, it helps to remember your successes in life (Six of Wands) instead of focusing on your losses. B. It’s great to be supportive of other people’s endeavors (Six of Wands), but be sure that you don’t lose something (Five of Cups) in the process. A. We all like to think that we are as compassionate and emotionally giving as the Six of Cups suggests, but this virtue is sorely tested in the strife and disorder of our everyday rough-and-tumble life (Five of Wands). B. When the strife of the Five of Wands starts getting to you, remember to be compassionate and try to make a loving connection with other people, as we see in the Six of Cups. A. When the Seven of Cups indicates confusion about where your heart is leading you, the Four of Wands can help with its suggestion that you should gain some stability in your life through a celebration of where you are at right now. B. The Four of Wands may indicate planning a celebration, such as a reunion, festival, or wedding. In that case, a warning from its CP card, the Seven of Cups, is that it is easy to get lost in a confusion of options for such plans. A. What I often see in the Eight of Cups is a person moving away from something and suffering feelings of regret about it, even though they know it’s the right thing to do. What can help in that case is the advice of the Three of Wands, which is to keep in mind the big picture as you set out for your destination. B. As noted in a recent Ask KnightHawk reading, acting upon your vision (Three of Wands) may require you to leave behind old ways of doing things (Eight of Cups). A. The Nine of Cups is often called “the wish card,” but usually in order to manifest your wishes, you need the passion and drive to make it happen, not just the desire (Two of Wands). B. Sometimes the Two of Wands indicates the careful planning and preparation required for success, but then the warning of the Nine of Cups is to beware of becoming smug and self-satisfied before you’ve successfully executed those plans. A. The Ten of Cups can warn of having an overly idealistic image of a happy home life. This sort of illusion blocks many people from happiness because they compare their imperfect life with that ideal. In order to overcome such problems, we can listen to the advice of the Ace of Wands, which urges us to pursue our desires with confidence, passion, and a concerted focus of will rather than just waiting for our dreams to come true. B. The Ace of Wands can suggest the possibility of a new enterprise that can transform your life. However, that seed must be nurtured through your energy and will, and the demands of your family life (Ten of Cups) may stand in the way of such effort. Again very enlightening. I had a thought this morning as I was musing over the contra cards in light of the new posting. I think it is worth getting out the contracard and positioning it either to the right or left of the ‘difficult’ card in question. It adds yet more by way of possibility. E.g. using the RWS with the 10 of wands, the contra card is the ace cups. To the right of the 10 of wands could show someone is helping you from behind the scenes, albeit they cannot take an active part. Trying to temper your emotions so you can be objective about the load you are carrying and why. If it were in front (i.e. to the left of the 10 of wands) could show the way ahead is being eased. The water can soften or damp down the harshness of the environment. This is just my first thought and I wanted to get it out just to explain my line of thinking this morning. I am sure if I just muse it properly I can articulate the alternatives a lot better. If you did this with any contracard position James, just think of even MORE possibilities open. It really has opened a huge new door for me here. 🙂 I may go through all the other pairings as a personal exercise and come up with three possible ways:- 1) not placing it and having a general overview of how the CC card plays a part. 2) placing it to the left and seeing the dynamics 3) placing it to the right and seeing the dynamics. good point – I hadn’t actually thought it through at the time of typing. I just had to get my thought out whilst it was fresh, but you are right – practically may not be appropriate. I do have 2 of some decks, so if I kept one ordered it might work/be easy to find them. These are great James. Wonderful interpretations! 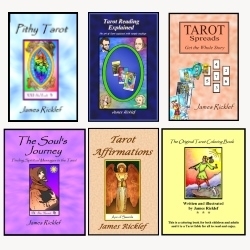 And by the way, I’ve been rereading your Tarot Tells The Tale (again) and recommend it so highly. It’s amazing how much more I’ve gotten out of it each time I’ve read it! And in the last chapter, your description of all the cards is outstanding! If you can post a nice review of TTTT (or any of my books) on Amazon, that would be great, thanks!